Published on 3 March, 2011 in FOSS and Korora. 0 Comments Tags: bug, firefox, gnome, kde, kororaa, Linux, oxygen, theme. I accidentally included the KDE Oxygen theme for the GNOME version of Beta3 (it was correct in Beta2). This means that GNOME users of Kororaa will get a KDE themed Firefox – not quite what I had in mind! KDE users don’t need to do anything, and should have a nice, pretty Firefox. So, thanks to Arv3n for posting it in the forums, I have fixed it for the next release, but you can also fix it yourself in Beta3. Here’s how. Published on 16 July, 2010 in FOSS. 3 Comments Tags: 300, 600, dpi, firefox, mozilla, print, ubuntu. Firefox on my Dad’s machine always wants to print to 300 DPI by default. He can manually change it, but it’s annoying. Other browsers pick up the printer default of 600 DPI and are happy, but not Firefox. He posted a bug on Launchpad for it and then afterwards I found a fix for it upstream in Mozilla’s Bugzilla. So anyone who has the same issue, here’s the work around. Published on 31 January, 2010 in FOSS. 0 Comments Tags: firefox, gconf, gnome, kde, links, opensuse, thunderbird, web. My mum’s machine runs openSUSE 11.2, with KDE 4. She continues to use Thunderbird as her mail client as it is familiar. Naturally she also uses Firefox for web browsing. Unfortunately, web links don’t seem to work which is rather annoying. Firefox is set as the default web client, as is thunderbird for email. My guess is that Thunderbird is looking for some GNOME configuration on what to do. I tried adding some custom handler arguements in Thunderbird’s config (like about:config in Firefox), but that didn’t work. Restart Thunderbird and all is good! Published on 8 January, 2010 in FOSS. 0 Comments Tags: firefox, kde, theme. Firefox is the most popular browser on the Linux platform, but it’s a GTK app and doesn’t integrate as nicely into KDE (which uses Qt). There are a number of ways to get it to integrate better, such as kgtk, but this is an easier and more stable method. The Oxygen KDE Firefox addon does a great job of theming Firefox to look like a KDE app. Simple download it and drag to add-ons. I scanned the extracted files with ClamAV and it was clean, but I always recommend that you do the same yourself for 3rd party add-ons. Unfortunately it doesn’t modify Firefox to use KDE’s file manager or anything like that (unlike openSUSE’s modification), it’s just a theme. But it certainly looks great! There are some extra things you can do to make it integrate even better. Search for ui.allow_platform_file_picker and set it to False. Restart and now you’ll get a simple, but KDE themed file picker. 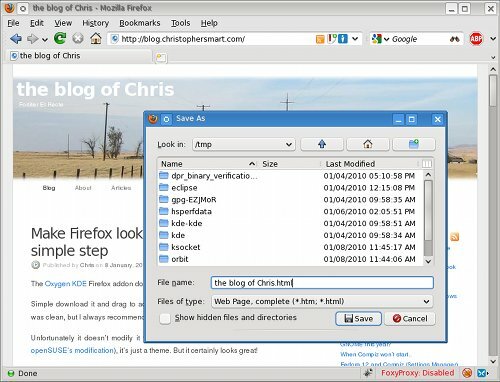 Install the PlasmaNotify add-on to get Firefox to use Plasma for notifications. Turn off the “Downloads window” under Preferences, for a more integrated experience. You can get Firefox to download with KDE’s KGet download program by installing the FlashGot add-on. Published on 20 November, 2009 in FOSS. 0 Comments Tags: email, firefox, mozilla, thunderbird. Marco Zehe writes that Thunderbird 3.0 will be out soon. While four main issues remain, there have been lots of improvements, especially in the area of accessibility. Firefox has certainly stolen the show over the last number of years, so it’s great to see Thunderbird getting some love! Published on 16 July, 2009 in FOSS. 2 Comments Tags: bug, firefox, Linux. I love Firefox, it’s a great web browser. But there are two things which have annoyed me forever and it’s about time I did something about it. The first is the in relation to the ability to save tabs for the next time Firefox starts. I love this feature. When you have multiple tabs open and you close your last main window it prompts you to “Save and Quit”. When you open Firefox next time, it will automatically open the same pages in the same tabs. But this doesn’t happen if you have another main browsing window open. Fair enough, I guess. The thing that bugs me is that it doesn’t prompt you if you only have the “Downloads” window open, for example. I get why this is the case – Firefox is still running. In fact, if you close the main browsing window and leave the downloads window up, Firefox is still running, just without any windows present. What I’d like to see is for Firefox to prompt you to save your tabs if all you have open is the downloads window. It’s annoying to have to cancel the close quit request, go and close the download window, then come back and close Firefox again. Hell, close the download tab too if you like, I don’t mind! I’m assuming the way it’s coded to work is to check if it’s the last “Firefox” window open, and is so, prompt if there are multiple tabs open. If not, then just quit. Changing the way it works might require a considerable re-write of the code and also open some new case bugs like what to do when the user is still downloading, but hey. Try it yourself. Open a few tabs, quit Firefox and note the option to “Save and Quit”. Then open the download window (CTRL+Shift+Y on Linux) and try again. No option to “Save and Quit”. The Just another Linux geek archives for the firefox tag.